It seems that the more I read Joel C. Rosenberg’s theology, the more skeptical I become. But if I ignore that, his latest book Damascus Countdown is a gripping read about what the start of the end times might be like. 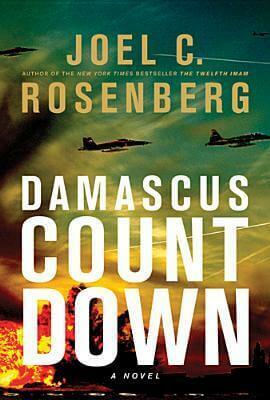 Damascus Countdown is the third book in the Twelfth Iman series of books. It follows the CIA undercover operative David as he tries to stop Israel from being attacked by nuclear bombs. The mastermind behind this is The Twelfth Imam, who’s is gathering all the Islamic countries into one Caliphate in order to become lord of the age. What I liked about this book was the tight writing and the characterisation. There’s a large cast of characters, but I felt as though I knew most of them personally. And even though I felt that the characterisation was well developed, it wasn’t at the expense of the plot. The book moved along at a quick pace, with a very exciting end. Apart from the main plot, there are a few subplots, such as what’s going on with David’s family and the former Shia-theology scholar turned Christian Birjandi and his dilemma on whether he should answer the summons of the Twelth Imam. Personally, I find it very hard to understand End-Time prophecies, especially with all the disputing schools of thought. That’s why I’m very skeptical when things are written as though they are definitive, with no reference to other interpretations. Well, there’s that and the fact that this book was focused solely on America and the Middle East. I understand the need to have the Middle East as the main region, but why is America the other big player? Where are the Asian countries? If I remember correctly, China is mentioned two times, India once and the rest of Asia barely at all. This is strange considering that this is where significant economic growth (and with it, political growth) is concentrated. I’m actually fairly sure that the Asian countries pull weight in the international arena as well. For example, Malaysia has ties with the Middle East, and has even offered to be a peace broker. Their Prime Minister Najib even visited Gaza in the recent past. In conclusion, this is an exciting and enjoyable work of fiction. The only thing that I have doubts about is the over the theology, and what I think is an inaccurate portrayal of global politics. Disclaimer: I received a complimentary copy of this book from Tyndale Blog Network in exchange for a free and honest review.